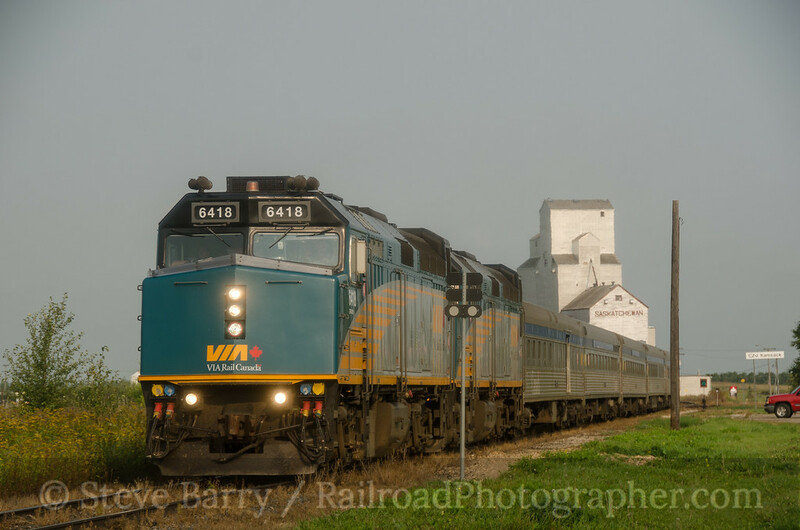 VIA Rail Canada is the national railroad passenger carrier in the Great White North. 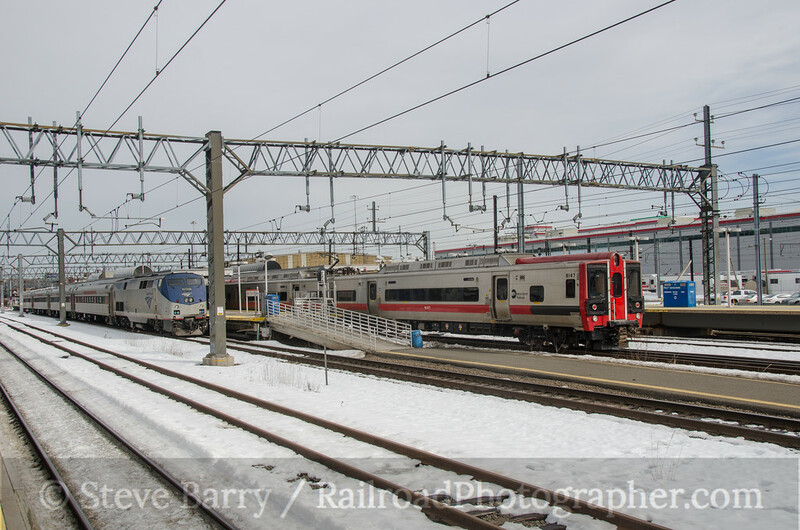 After its inception in 1976 when it took over passenger operations from Canada's freight railroads (primarily Canadian National and Canadian Pacific) it set about to modernize its locomotive fleet. 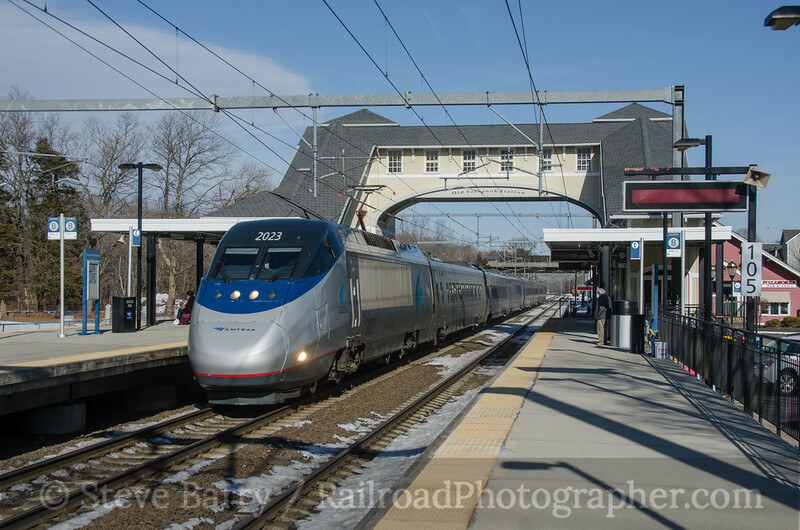 Much like Amtrak in the U.S., VIA settled on the F40PH locomotive from the Electro-Motive Division of General Motors. The locomotives came in an attractive silver and blue scheme with a bright yellow nose (such as No. 6404 above at Lake Louise, Alberta). In the years since, the F40 fleet has been thinned due to age, and the survivors all wear VIA's new scheme (inset). Here are a few of my favorite photos of the old paint scheme that served the F40 fleet so well. We'll start in the Maritimes with the Ocean, VIA's train from Montreal to Halifax. Here No. 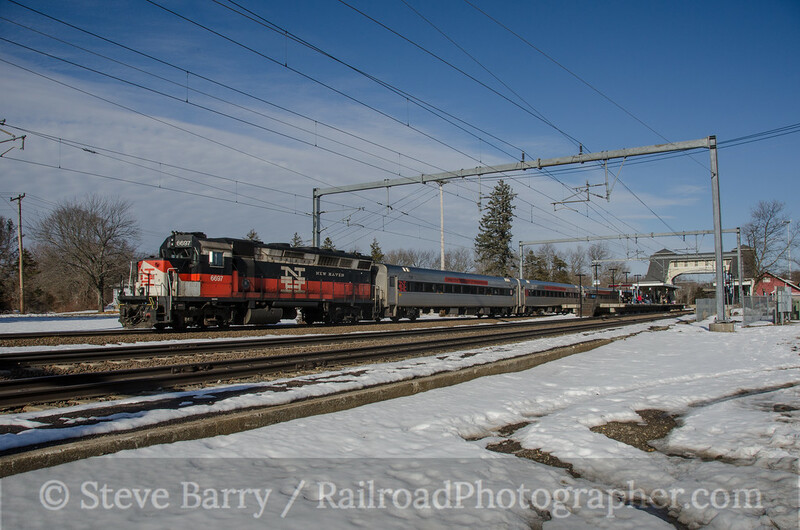 6409 is leading the eastbound train at Beaver Brook, New Brunswick. The "Canada" under the headlight was a later paint scheme modification, moving "VIA" to above the headlight, a positive development for the paint scheme. 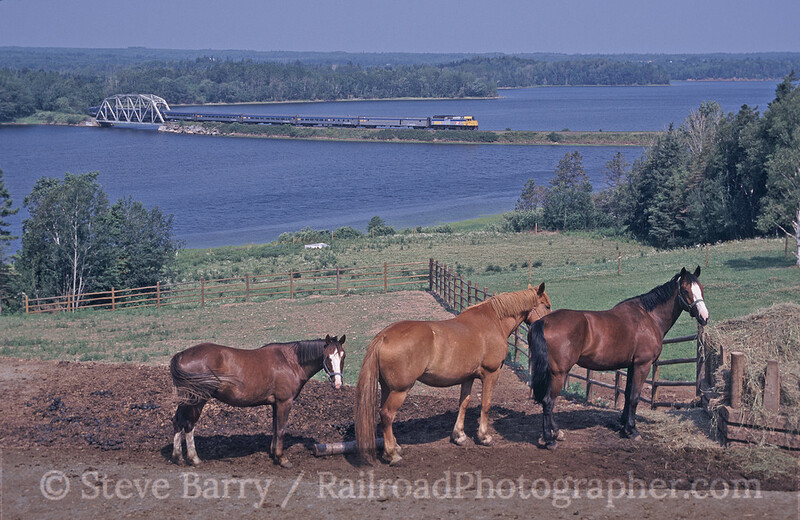 Sticking with the Maritimes, we next see the Bras D'Or, a fairly short-lived train that ran from Halifax to Sydney, Nova Scotia. 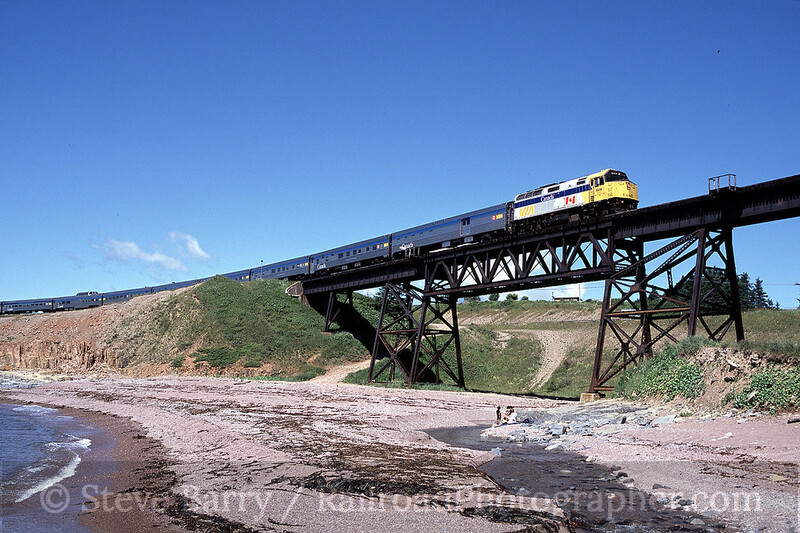 Largely a tourist train, the once a week trip headed out of Halifax one day and returned the next through some spectacular oceanside scenery, We see the train at Boisdale in July 2002. VIA purchased several sets of low-slung railcars with matching low-slung locomotives (for taking curves at higher speeds). The cars on the LRC train sets (Light Rapid Comfortable) would outlive the locomotives by quite a bit, so F40s could often be found towering over the trailing consist. Interestingly, even though the F40s had a much higher profile than the LRC locomotives, the higher speed limits for LRC trains on curves remained in place. F40 No. 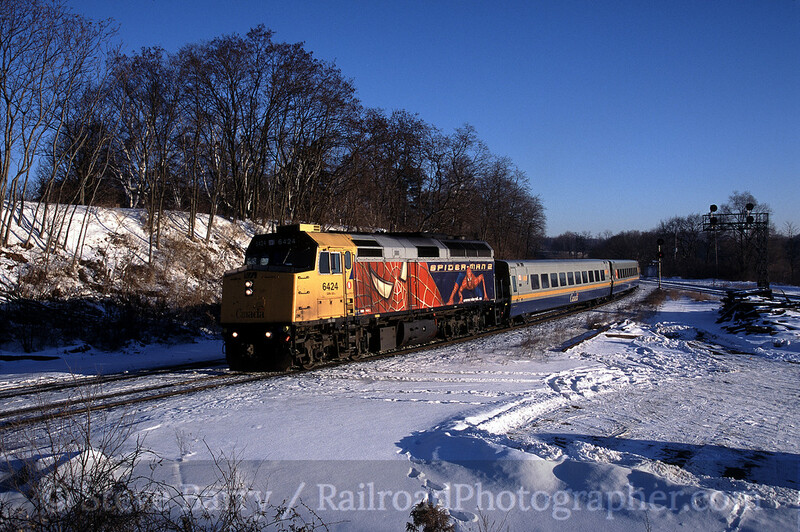 6434 is dashing through the snow with an LRC trainset at Ile Perrot, Quebec, just a few minutes away from its destination in Montreal. Let's head to western Canada for a couple of shots. 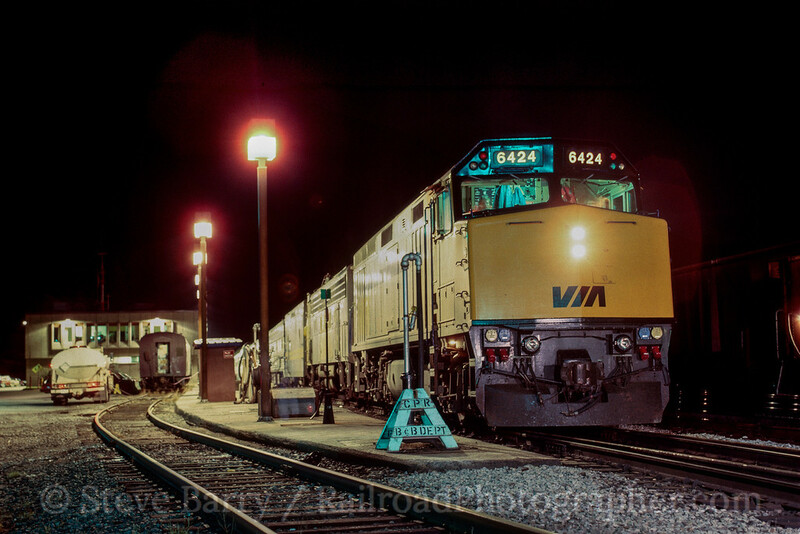 We'll start off in Revelstoke, British Columbia, as the Canadian makes is after-dark station stop. 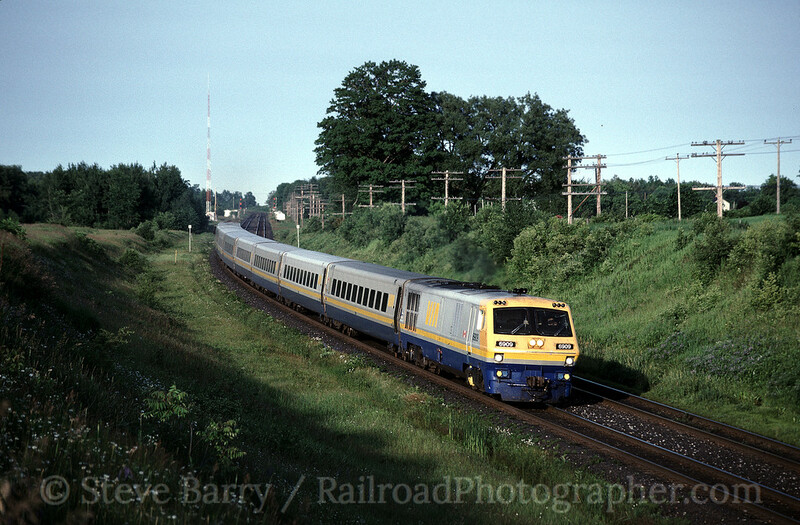 In the 1980s the Canadian railroads remained far friendlier and accessible than the U.S. railroads, which were beginning to clamp down on access due to liability. 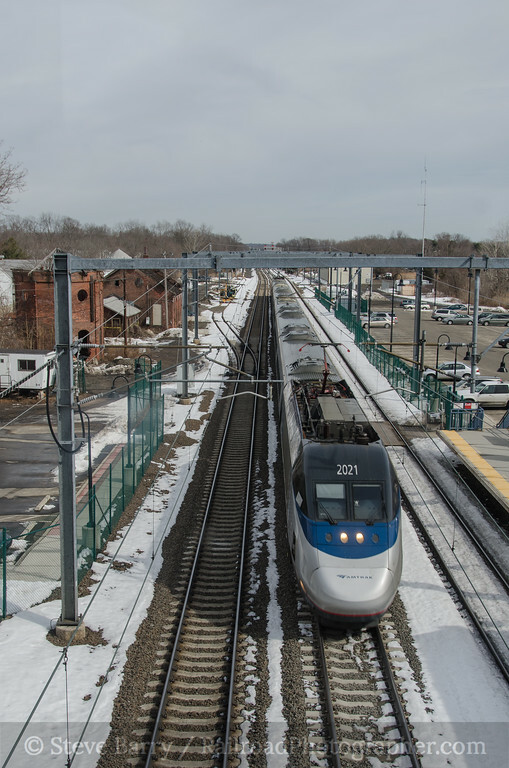 We went to the end of the platform with our flash gear before the train's arrival and asked an employee "where will the locomotive stop when it gets here?" His reply: "Where would you like it to stop?" There is no scenery in North America quite like the Canadian mountains of Alberta and British Columbia. F40 No. 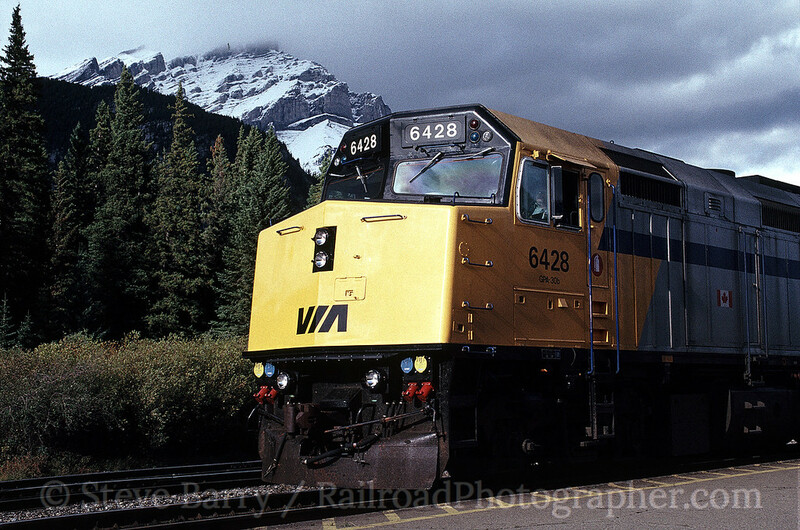 6428 pauses with the Canadian at Banff, Alberta, the gateway to the heart of the Rocky Mountains. 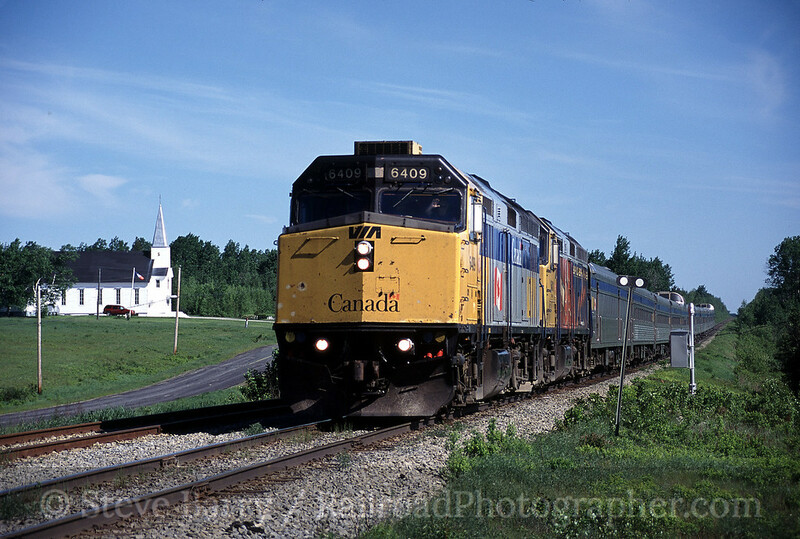 Certainly a favorite train for both photographers and riders is the Chaleur, a try-weekly train that runs on the Gaspe peninsula in Quebec. 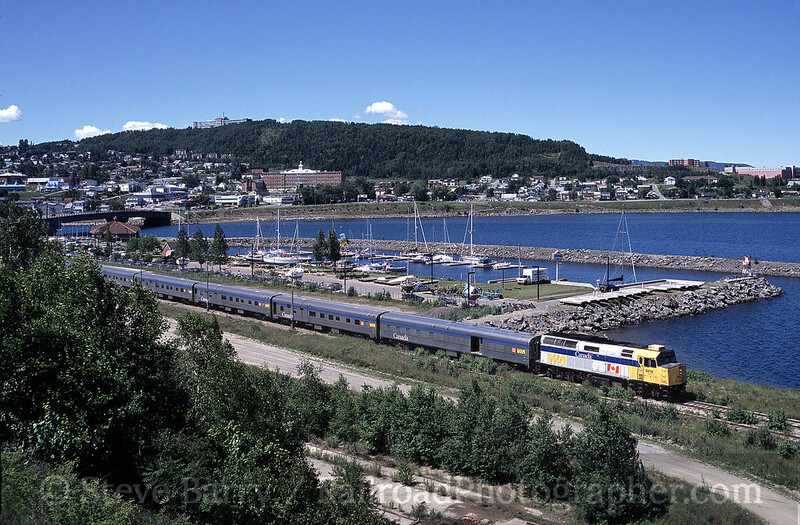 The train leaves Montreal combined with the Ocean for an overnight run to Matapedia. At daybreak the train is split, with the Ocean continuing to Halifax and the Chaleur proceeding to Gaspe. 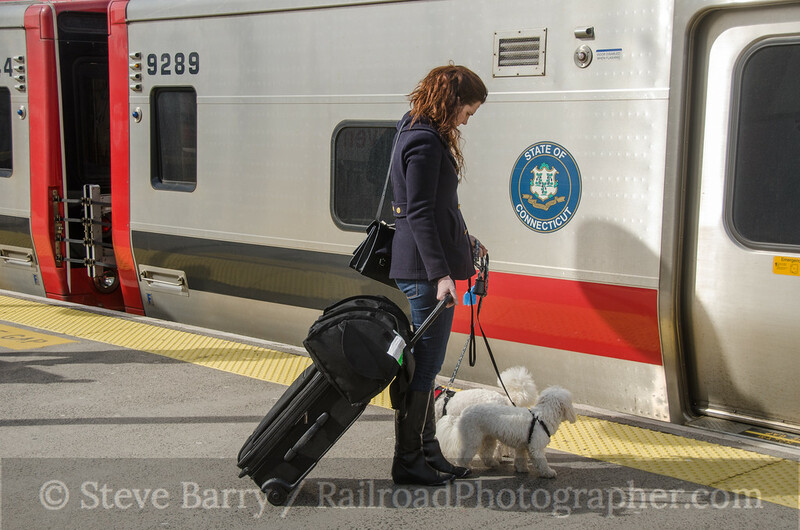 Adding to the train's charm is the equipment -- the coaches are all stainless steel cars produced by the Budd Company in the 1950s. There are several high bridges on the route, including this one at Ste. Therese, Quebec. At Gaspe the train turns on the wye and pauses for a few hours before returning west, making it a perfect train for a day trip of either photography or riding. The train has discharged its passengers and is backing into the station for the lunch break after turning in the photo below. Alas, as this is written, the track on the Gaspe peninsula has deteriorated to the point where the Chaleur is now suspended. It's future is very much in doubt. 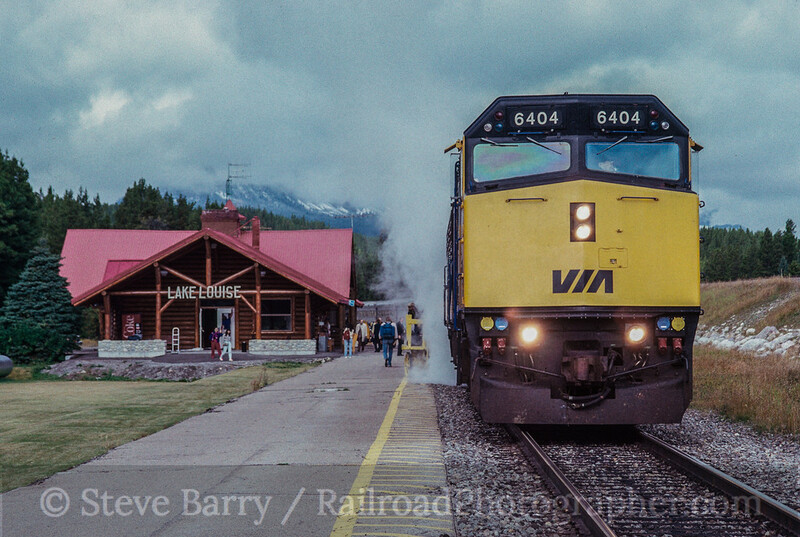 VIA has never been shy about painting its locomotives into rolling billboards. Everything from hardware stores to television stations to beer have been on the sides of F40s. I have had bad luck shooting most of these schemes, but the one scheme I did see (and I saw it a few times -- six F40s got the treatment) was for the Spiderman movie. We'll take a look at Spidey rolling through Bayview Junction near Hamilton, Ontario, to bring an end to our look at the yellow nose F40s of VIA. 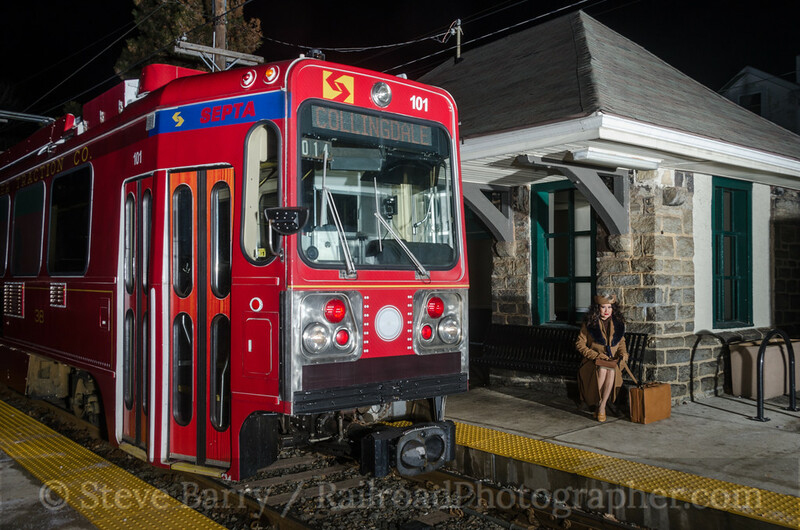 This year will mark the 50th Anniversary of the Southeastern Pennsylvania Transportation Authority, which unified most bus, streetcar and light rail service in and around Philadelphia in 1964 (heavy rail operations were later added in 1981). While no formal large scale celebration has been yet planned, there have been some rumblings and rumors about smaller scale acknowledgements of the anniversary, some coming from employees and management within the organization. 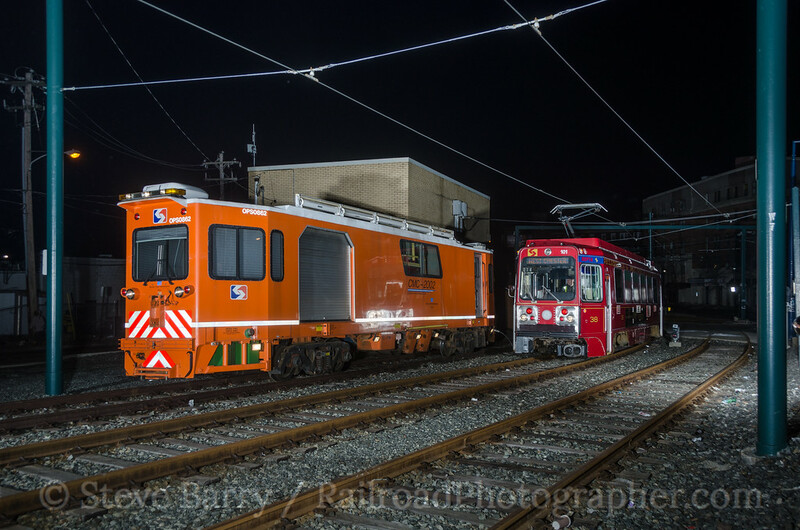 One of those smaller scale acknowledgements came on the night of March 1 (into the early morning of March 2) when a group of employees from SEPTA's Red Arrow Division (the operator of suburban service based out of 69th Street Terminal in Upper Darby) and members of the railroad media took Kawasaki car No. 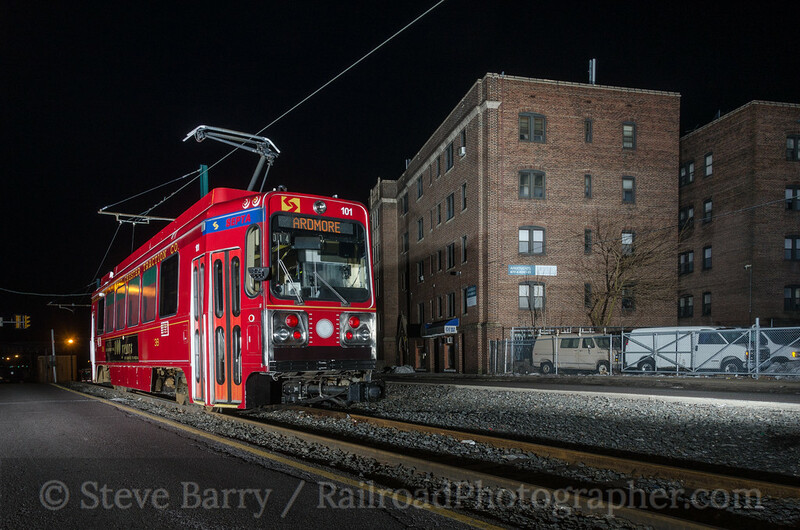 101 out for a set of night photos to be used by SEPTA and for magazine publicity. Car No. 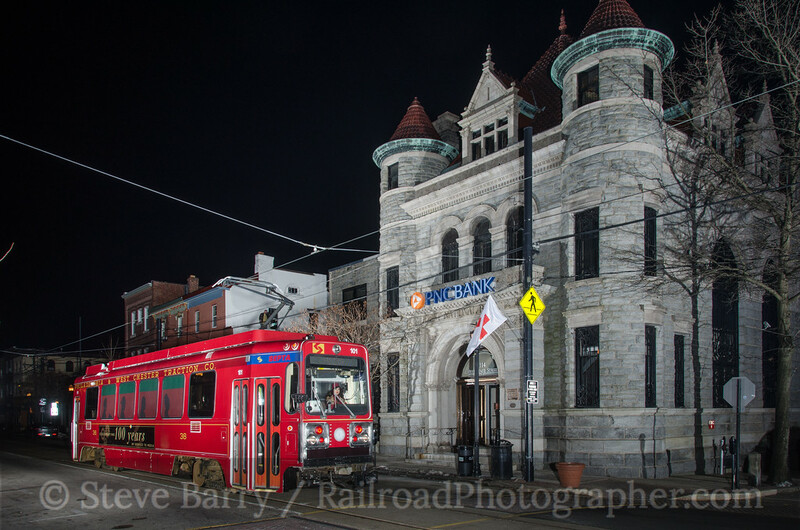 101 is wrapped in the colors of the Philadelphia & West Chester Traction Company, a Red Arrow predecessor that would have celebrated its centennial in 2013. 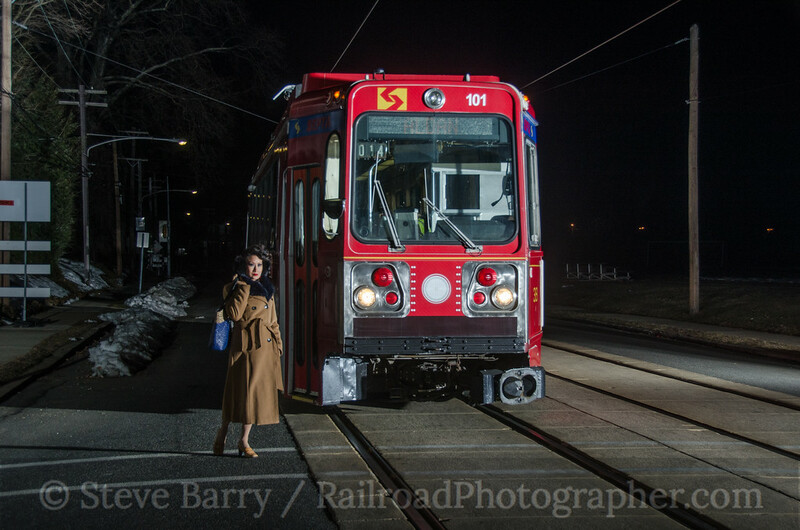 The trip was designed to use both the Sharon Hill and Media lines of the hybrid streetcar/light rail route out of 69th Street, operating overnight when there are no regular service cars out on the line. Beginning just before midnight, the first stop was made just outside the terminal where car 101 posed with the wire car used on the routes. This stop allowed the last of the regular service cars to get back into 69th Street for the night. By this time the clock had ticked past midnight into the morning of March 2. 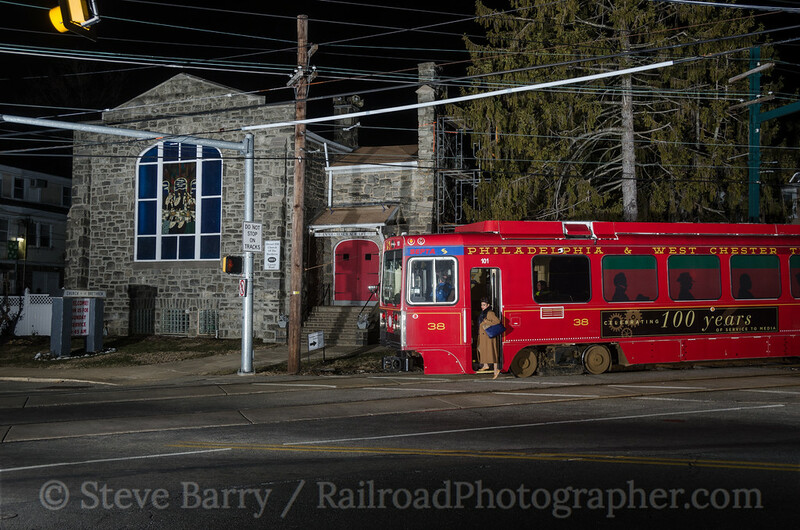 The first stop was made in Drexel Hill next to a church. Lady Camille, who models professionally, was along to add some life to many of the scenes. 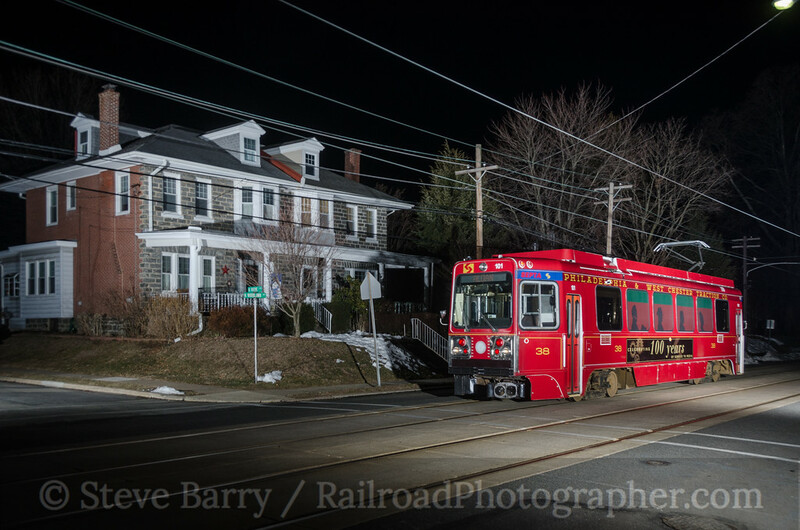 On the Sharon Hill Line, the next stop was made in the residential area of Aldan where the tracks are in the street; much of the Red Arrow Division trackage is actually on private right-of-way like the interurbans of old. And once again Lady Camille posed for a shot with car No. 101. The Red Arrow Division has several small stone stations along the way, and a couple of these were used for stops during the night. 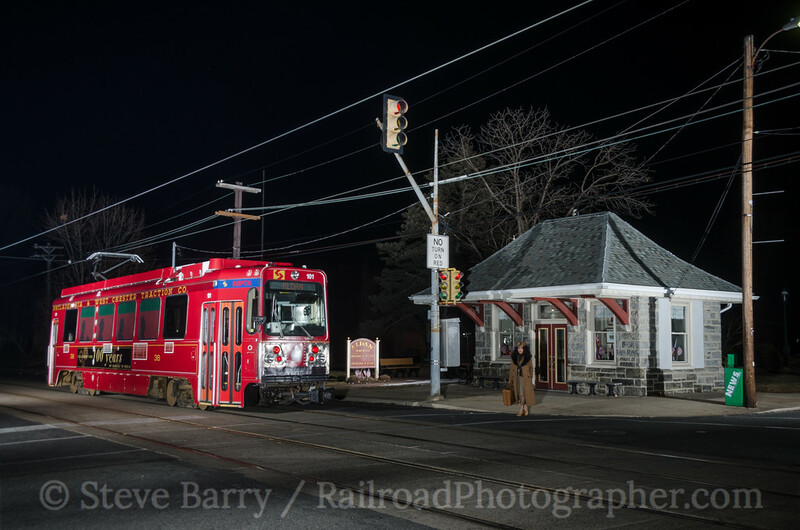 The next-to-last station on the Sharon Hill line is at McDade Boulevard in Collingdale. Heading back towards the city, another shelter -- this one at Aldan that is now a small museum -- was used. Unlike McDade Boulevard and most of the other stations, this one is located on street running and thus sits back from the track. Now it was time to head out on the line to Media. 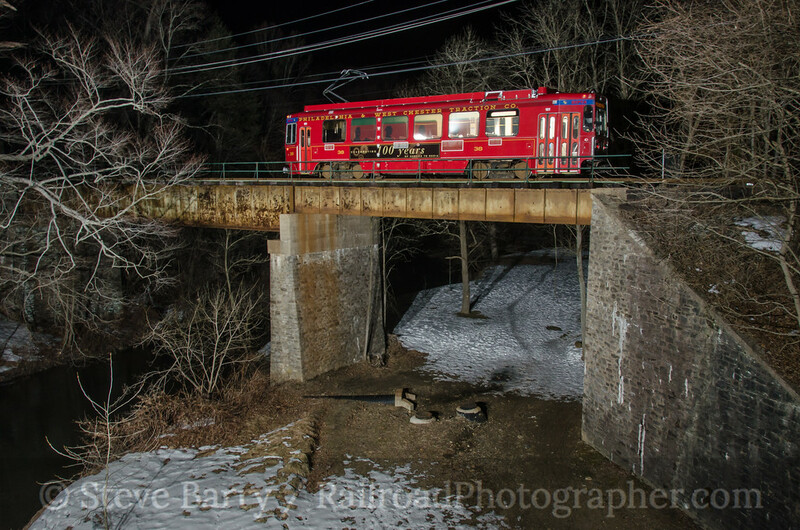 The signature shot on that line is crossing the bridge at Smedley Park in Springfield. Downtown Media has some very interesting buildings along State Street, with the Red Arrow line occupying the middle of said street. One is the Media theatre. Moving towards the very end of track, a nice bank building is also found along State Street. Both the theatre and the bank are located on the south side of State Street, which means they would be against the sun for photography on a nice day. Night photos proved to be the best way to capture them. The clock was rapidly ticking the night away, and soon it would be time for the morning regular service cars to come out of 69th Street. 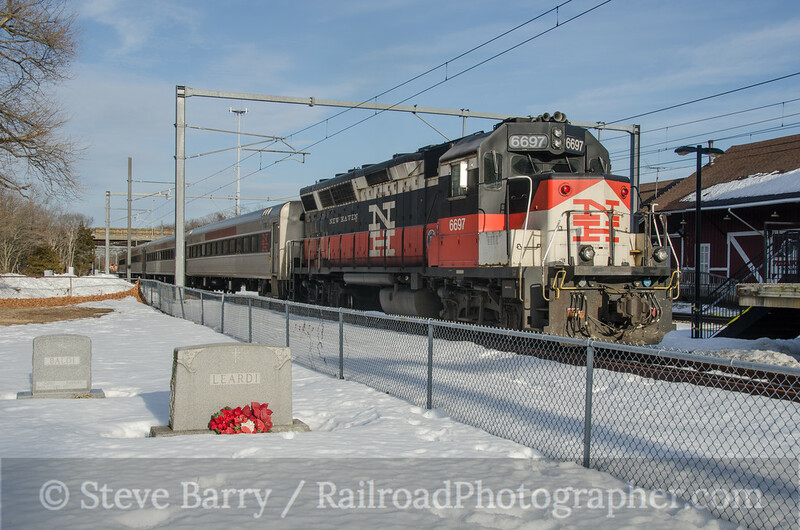 One last photo stop was made at a signal at Springfield. 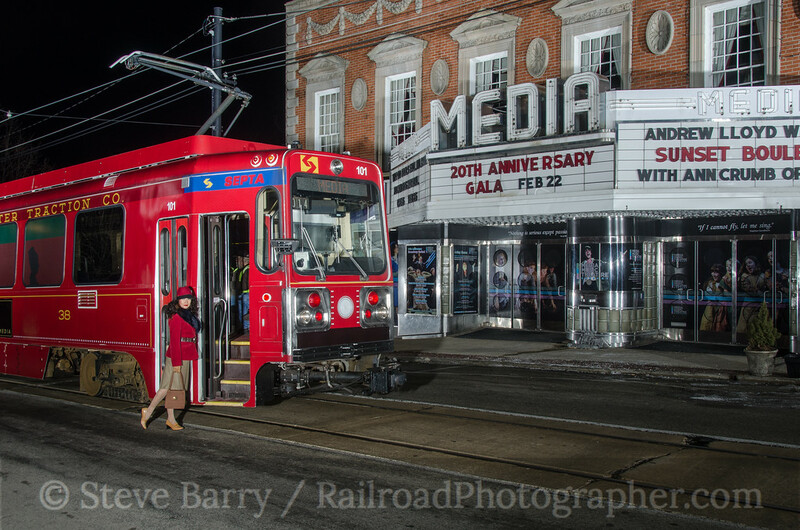 From there, it was back to Upper Darby for a sunrise arrival, ending a very interesting night of photography. All the photos were illuminated using Alien Bees strobe units provided by Bruce Barry, Michael Burkhart, John Gabriel and yours truly. 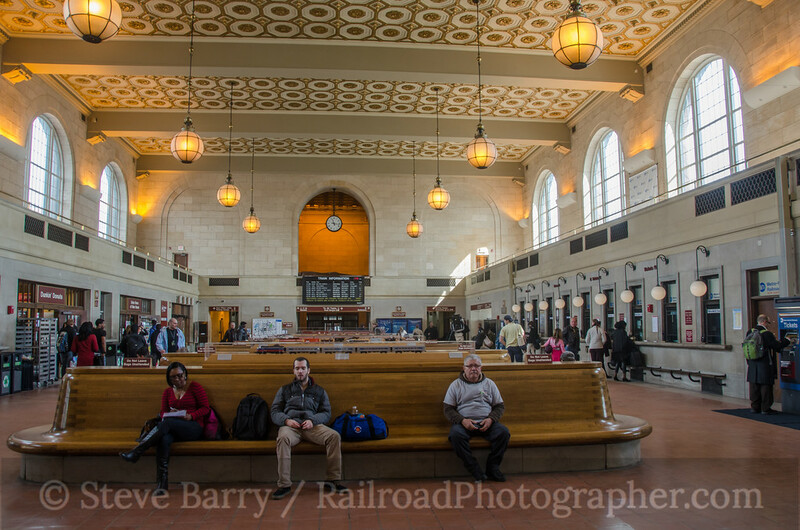 More photos from this trip can be found here. 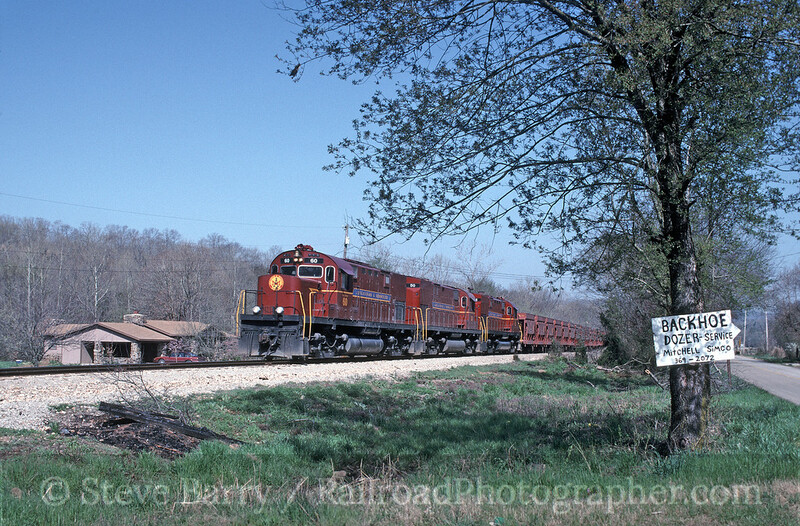 The Arkansas & Missouri Railroad, located in the northwest corner of Arkansas, has long been a railfan favorite. Most of the excitement comes from the fact that -- until recently -- the railroad only operated locomotives built by the American Locomotive Company. While many photographers have made many visits to the A&M, I have only spent one day on the line, and that was back in 1993. 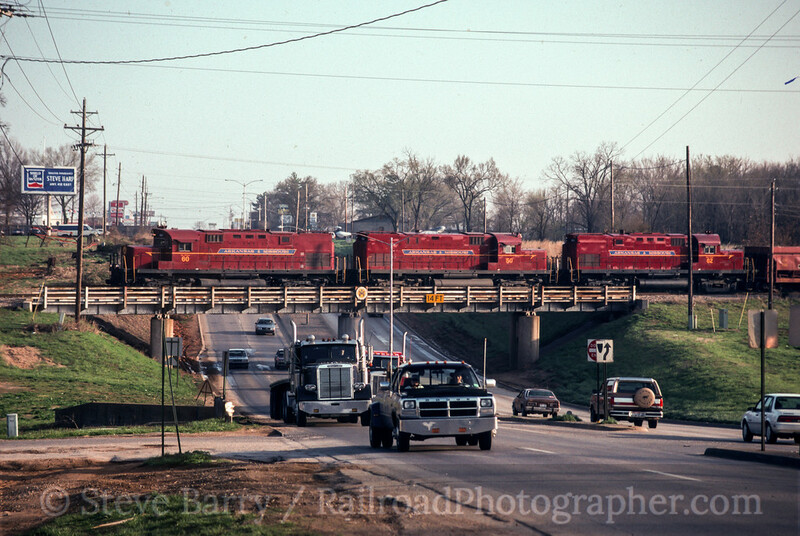 In this edition of Cool Chromes we'll chase a southbound train from the railroad's headquarters in Springdale down to Van Buren, starting with the train coming out of Springdale (above). 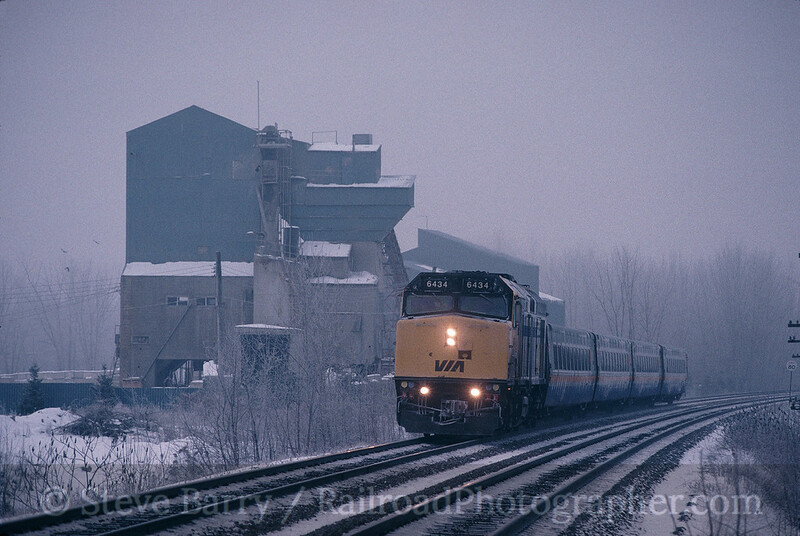 The power on the train on this day is three Alco C420 diesels -- Nos. 60, 50 and 62. We next catch the train near Chester, where you can apparently rent a backhoe. Winslow Tunnel is the scenic highlight of the line, but I was faced with a decision -- the shot of a train emerging from the south end of the tunnel is a long walk-in shot and would mean forsaking most of the chase. I opted for a more aggressive chase to catch the train multiple times, and thus settled for this shot taken from the north portal of the tunnel as the train is about to enter. I did catch the train a few more times than what is pictured here. 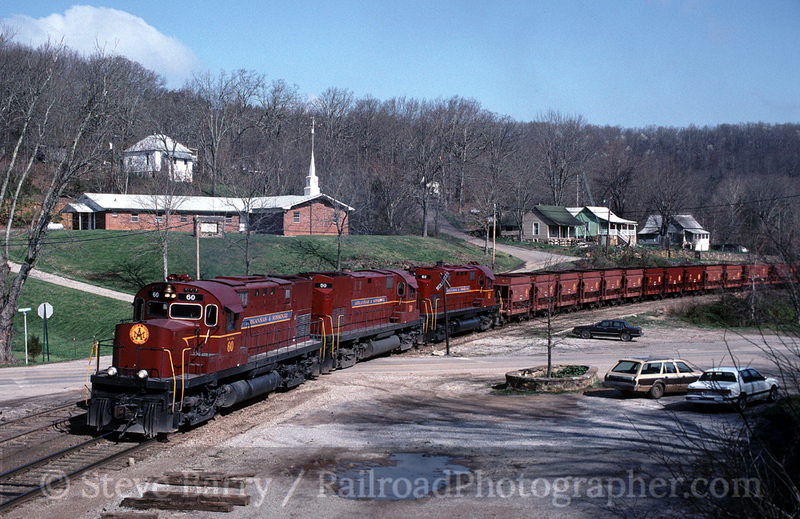 The train arrived in Van Buren and I headed across the Arkansas River where I shot Alco T6 No. 12 working. 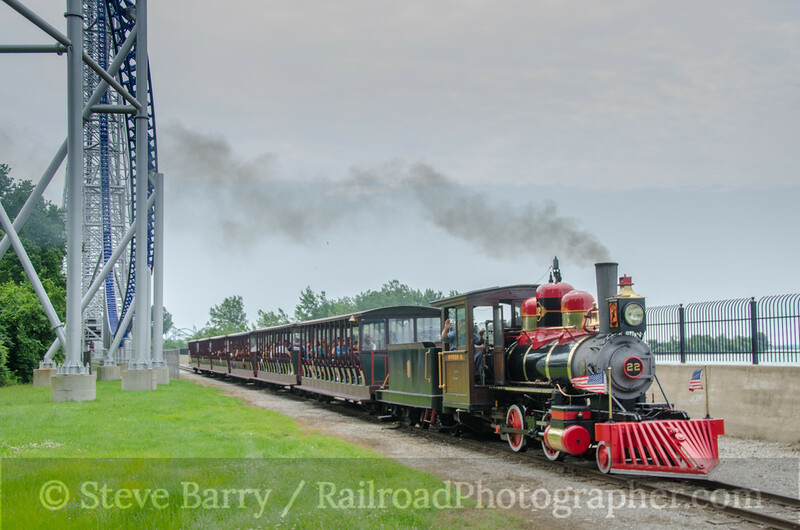 I will be returning to the A&M in June, as it is the host railroad for most of the activities at this year's convention of the National Railway Historical Society. 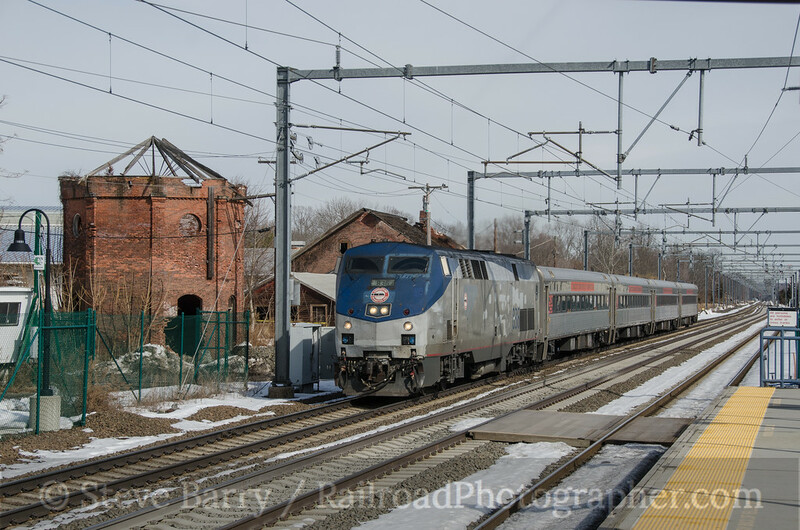 While the line is no longer 100 percent Alco powered (some diesels from General Motors' Electro-Motive Division have joined the roster), there are still plenty of the classics running and it should be a great event! We've been on the road for the past week or so and haven't had a chance to get through all of the new photos. 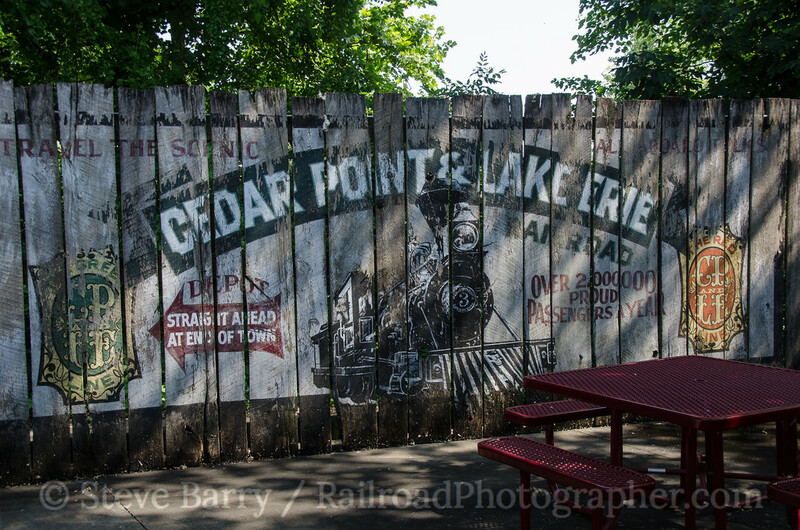 We've been experiencing a winter that just won't go away this year, so to take off some of the chill while we get a bunch of new photos ready, let's think summer for a minute and explore the Cedar Point & Lake Erie Railroad, a three-foot narow gauge railroad located in the famed Cedar Point theme park near Sandusky, Ohio. 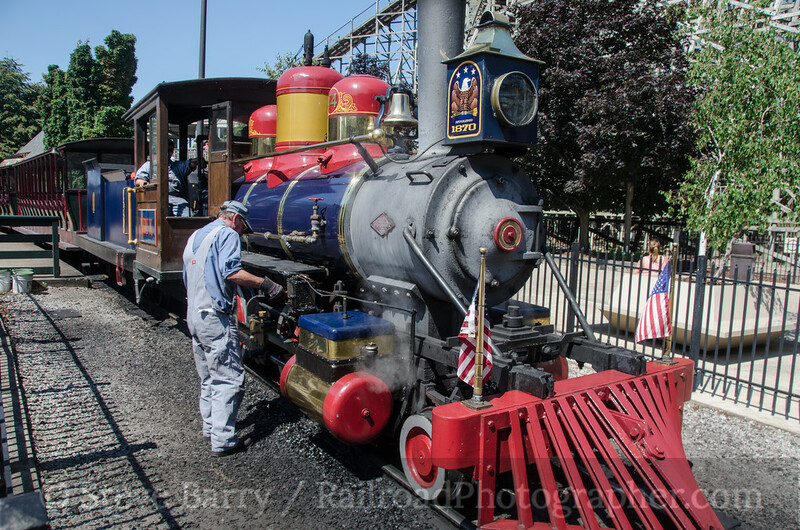 Last year was the railroad's 50th anniversary, and it is unusual in that it still uses coal-fired steam locomotives -- most theme park locomotives have been converted to natural gas. The railroad rosters five locomotives, all with interesting histories. We'll run down the roster and then look at some of the better photo angles in the park. We'll start with CP&LE 2-4-0 No. 22 (above). Named Myron H. (in honor of Mike Hetrick, a former superintendent of the railroad) it was built in 1922 as an 0-4-0T by Vulcan Iron Works for Wayne Coal Company of Clay Bank, Ohio. 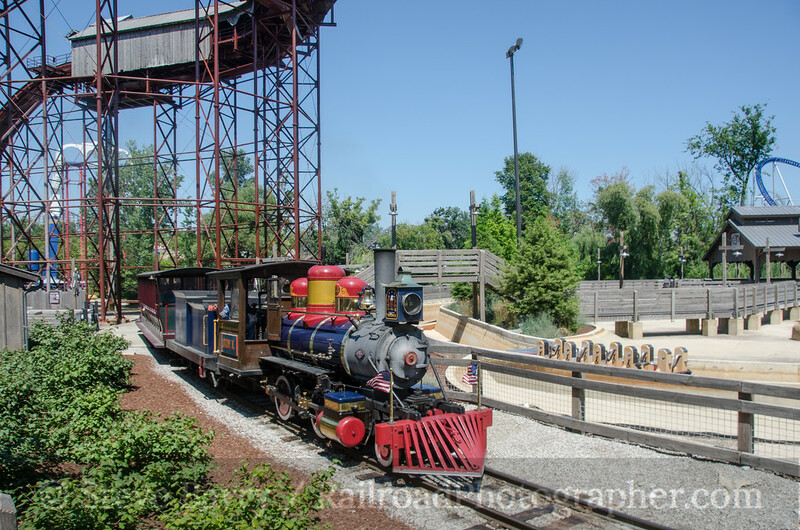 Subsequent owners took the locomotive to Alabama and Georgia, and in 1963 it was sold to Cedar Point. It is one of two primary locomotives in service at the park. Up next is the park's other primary engine, No. 44. 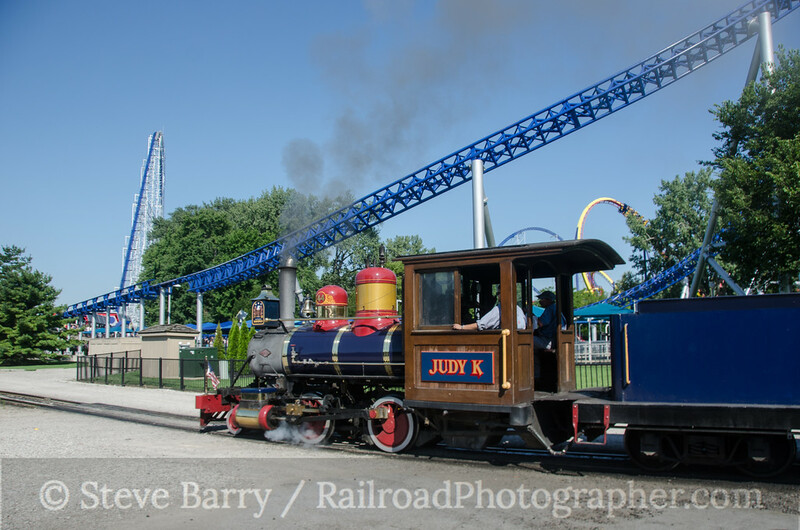 Now named Judy K. (in honor of Judy Kinzel, wife of Cedar Fair Entertainment Company CEO Richard Kinzel), No. 44 came from Vulcan in 1923, also as an 0-4-0T, and worked for John Marsh, Inc., of Lansing, Mich. It moved on to new owners in Illinois and Wisconsin and came to Cedar Point in 1968. In the shop we find No. 1, G.A. Boeckling (named for a former Cedar point owner), built for N&S Coal Company in Pittsburg, Kan., by Davenport Locomotive Works in 1927. 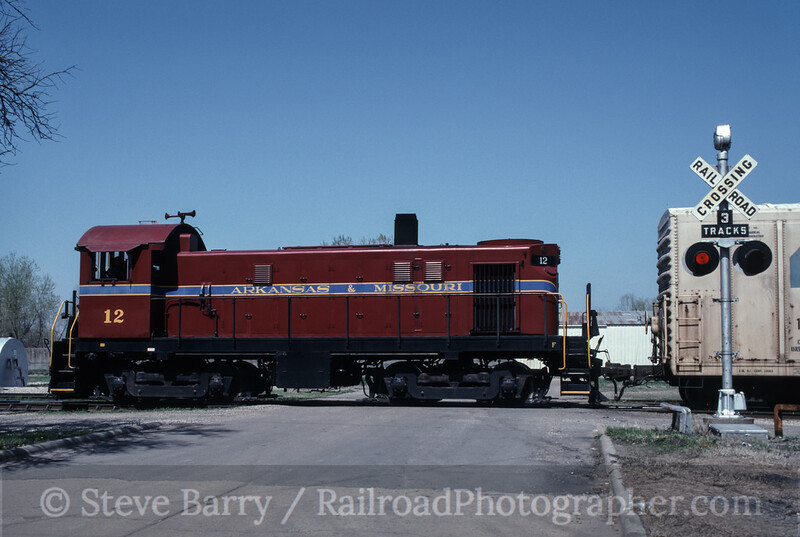 Like most Cedar Point locomotives, it was built as an 0-4-0T. 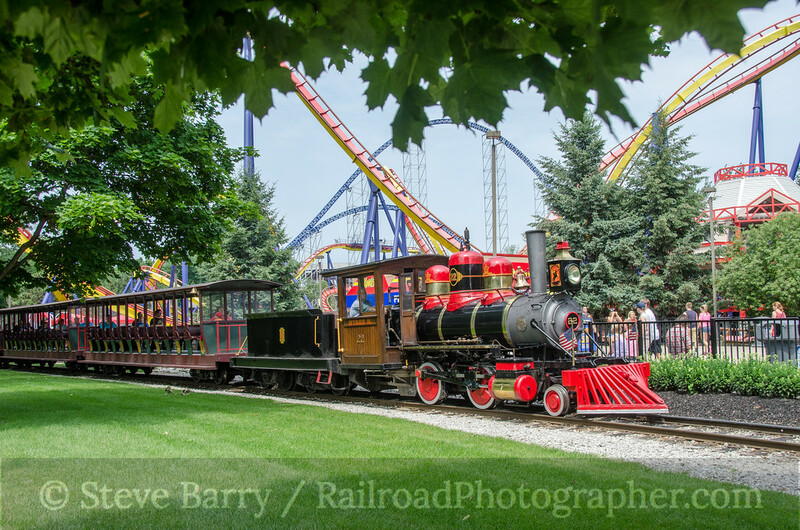 In 1977 the locomotive was converted to a 2-4-4RT and started a career on a variety of park railroads, beginning with Six Flags in Gurnee, Ill. In 1996 it was traded to Disneyland in California and named Ward Kimball in honor of the famous Disney animator. It headed across the country one year later, testing at Disney World in Florida before being put on display at Epcot. In 1999 it was traded to Cedar Point, but then went back to California in 2007 to work for Knott's Berry Farm. Finally, it landed back at Cedar Point in 2010 and was converted to its current 2-4-0 configuration. 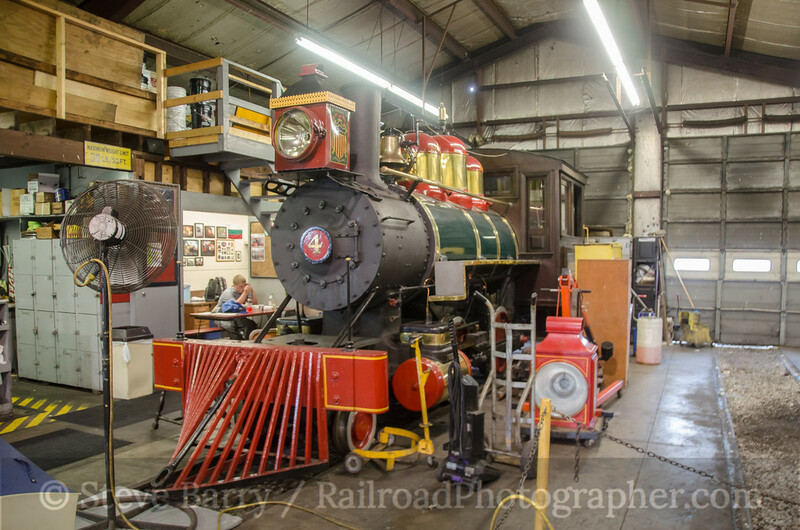 Also in the shop is the railroad's heaviest locomotive, No. 4. 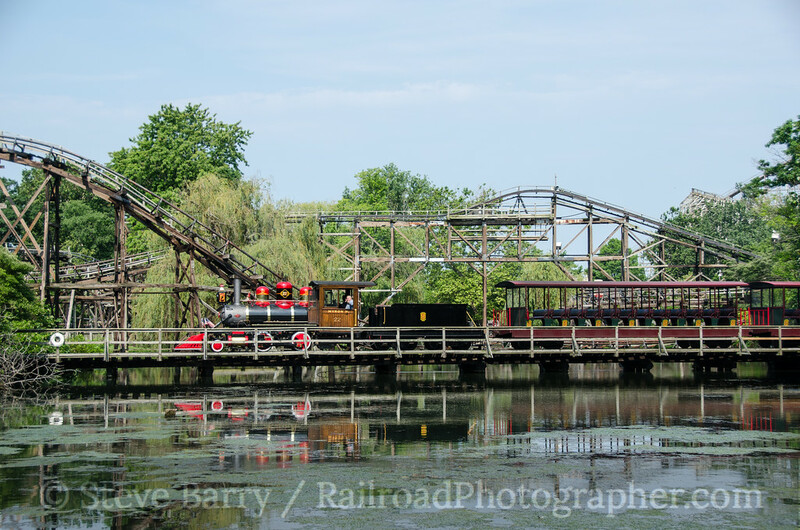 Named George R. in honor of George Roose, former president of Cedar Point and builder of the railroad, this former 0-4-0T was built by H.K. Porter Company in 1942 for Carbon Limestone Company in Pennsylvania. 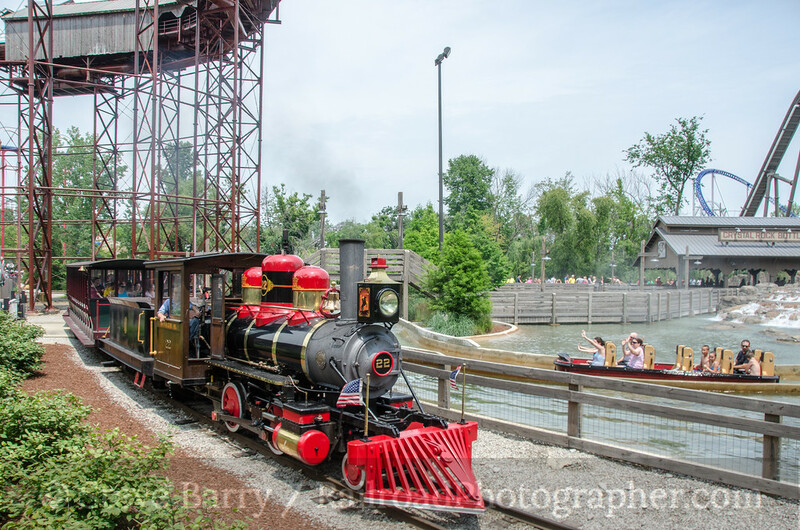 It went into theme park service in 1963, working at Cherokee Wonderland in Cherokee, N.C., before coming to Cedar Point in 1968 and being rebuilt as a 2-4-0. Due to its weight, it is the least used of the four in service locomotives at the park. 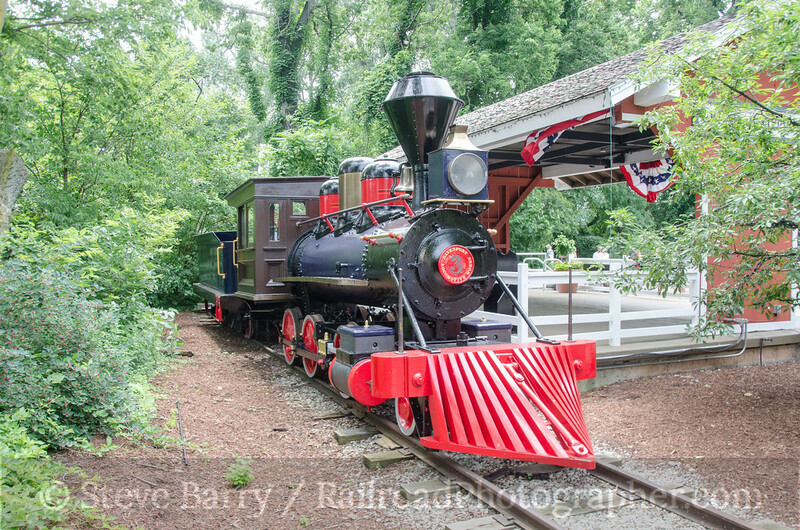 The last locomotive at the park is out of service but on display. No. 3 is named Albert and last operated in 1991. It's a 2-6-0 and was built in 1910 by Davenport for J.B. Levert for sugar cane service in Louisiana. It was sold to a scrap dealer in Louisiana in 1959, but moved on to Cherokee Wonderland in 1960. In 1963 it came to Cedar Point. Now that we have all the players identified, let's take a tour of the railroad. 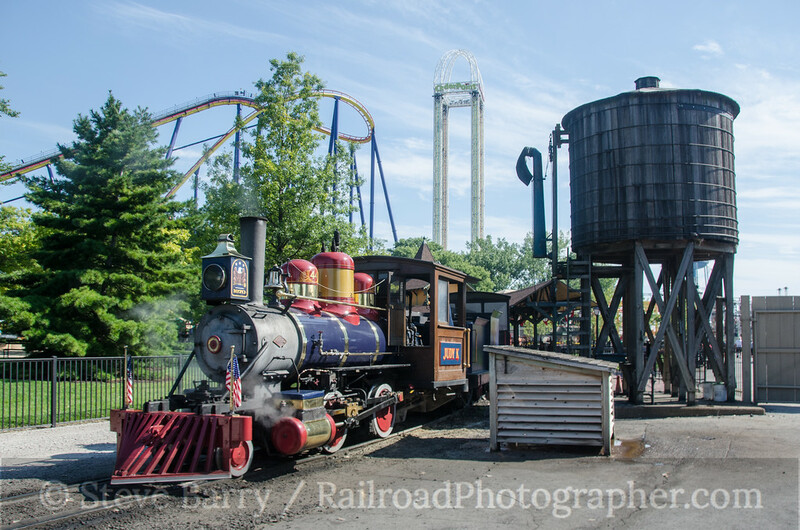 Operations are based out of the engine house adjacent to the Main Street Station and almost under the Millennium Force roller coaster (Cedar Point is the roller coaster capital of the world). Out of the station and running clockwise on an oval, the train rolls along with Sandusky Bay on one side and the Millennium Force and Maverick coaster on the other. At Frontiertown a stop is made to load and discharge passengers. 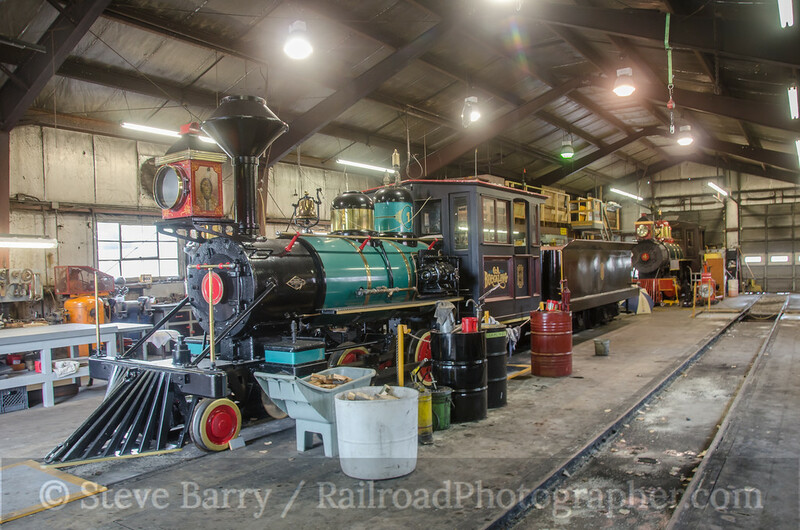 The crew also takes the time to service the locomotives at this point. Up next is the longest bridge on the line. Photographers can find a nice spot to shoot from behind the Camp Woodstock photo center. A shorter trestle can be found near the entrance of Shoot the Rapids. The view is from the walkway to the ride. 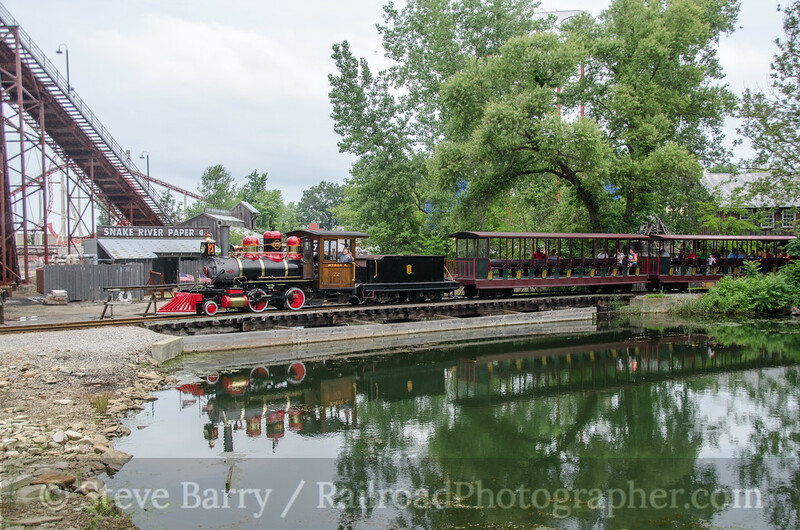 In the same area is the viewing platform for Shoot the Rapids, which also makes for a nice view of the railroad. As an added bonus, there are water cannons where you can shoot people on the water ride for 25 cents -- a nice way to kill time between trains. Finally we're approaching the Main Street Station again. The train passes through a colorful corridor of kiosks and coasters as it finishes off its loop. In all we spent three days at Cedar Point last summer. For photos from each of those three days you can follow the links to July 5, July 8, and August 18.